There are lots of surprises tucked into the construction of the Amish Cable Mill Flat Screen Mount Entertainment Center. There are slide out bookshelves tucked into the sides, a perfect row of top cabinets, rounded feet at the bottom and solid wood perfection you can brag about. 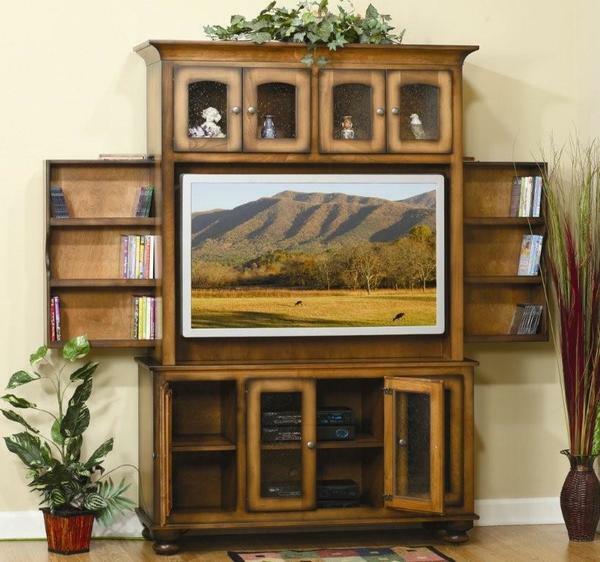 The Amish Cable Mill Flat Screen Mount Entertainment Center is shown here with the brandishing technique that gives the outer edges of the furniture a darker shade and the body of the furniture a lighter shade. In addition to providing storage and a showcase for your television, the Cable Mill center is an attractive centerpiece. This furniture is custom made to match your living room or family room and it will last for generations. Email or call us today to start your order. Thank you for being a DutchCrafters customer. Shown in OCS 104 Seely with Burnish.